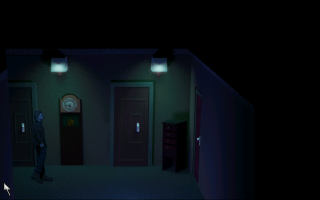 THE CHRYSALIS This is a stand-alone chapter of a possible freeware adventure game series. STORY Your character was invited by a person he knows since they were in school - they now are in their thirties. He falls in love with this person's apartment, due to the elegant rooms, but also the antique furniture and - last but not least - the paintings his host has created (they are macabre). While your character would like to just stick around and move from room to room, he is also a bit alarmed, because... his host has left him, without saying why; he just noted that he has something to do, and will return soon. You wonder if the other person has gotten involved into some bizarre story, or strange interests. Nevertheless... you are happy to be given the opportunity to explore the apartment on your own. This was an interesting game that requires a bit of trial and error to figure.